There is a common misconception about machine knitting. Most hand knitters think that it’s “cheating” and that the machine does most of the work for you. I’ll admit that I felt the same way until my arthritis forced me to try it. You know what I have found? The machine does not do most of the work for you, in fact I am convinced most days that it is actively working against me. One of the charming features about the knitting machine is that it has the ability to drop multiple stitches AT THE SAME TIME. Also the weights that are necessary for keeping the stitches from popping off the needles while you’re knitting also insure that when you drop a stitch it will immediately unknit multiple rows. Don’t get me wrong, I’m not bashing the knitting machine. 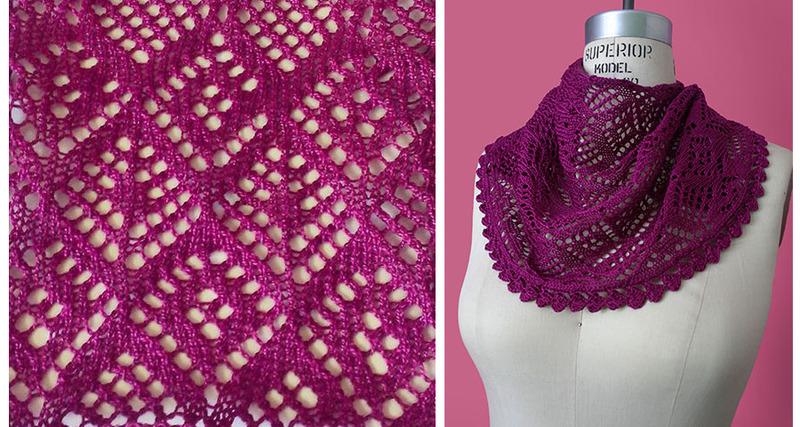 It has allowed me to continue enjoying my favorite hobby and it makes designing easier because I can knit hundreds of rows in one day and I’m not afraid of making a mistake because the thought of ripping out twenty rows no longer reduces me to tears. It’s just that the machine and I have a tenuous relationship. My pet rabbit has become so used to my expletive- filled outbursts of rage that he now sleeps through them. 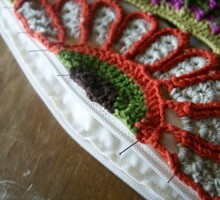 Once I mastered the stockinet stitch on the machine I got cocky and decided I was ready to tackle lace. The much-anticipated warmer weather in New York had me dreaming of girly summer garments adorned with lace. I feel like I had an extra month of spring because before the warm weather hit here I was spent a month in Morocco and Spain where almost every day was seventy five degrees and sunny. I’ll tell you more about my awesome trip later but for now I’ll try to stay on topic (BTW, you should follow my instagram account because I am much better at updating that in timely manner if you’re interested in following my adventures). So anyway, by the time I got back to NYC I whipped into a fashion-fueled frenzy and started learning to make some lacy pieces for my Etsy shop. 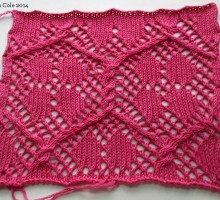 After quite a few tries and some help from a few lovely ladies on Ravelry, I even designed my own lace punch card (It’s the design shown at the top of this post). I still have a long way to go before I’m 100% comfortable with lace but I’m getting there!